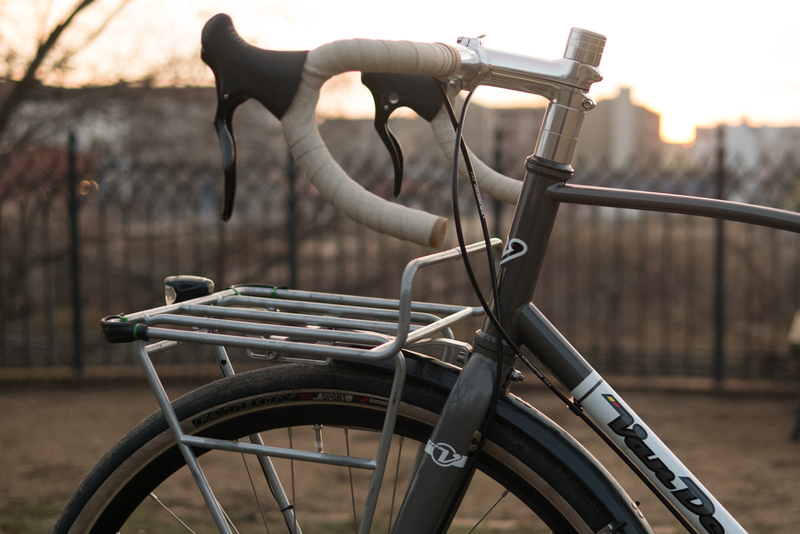 Introducing: Van Dessel WTF Commuter - nomusic. You would think that finding a bike that answers these specifications is easy. Sadly it’s not. I looked and looked and came up empty handed. There are loads of “almost” bikes that would match the requirements, but finding something in Europe, was even more difficult. As mom says “rich people’s problems.” Of course it’s always an option to build a customer frame, but the idea of locking a custom frame outside on the street did not appeal to me much. I wanted a frame that is replaceable should something happen without a lead time of a builder. I also wanted to sleep at night. 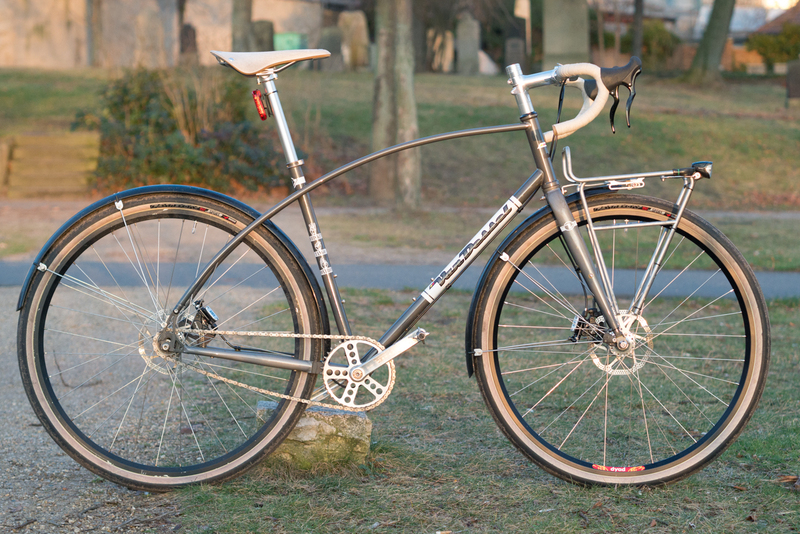 The solution came in the form of Van Dessel W.T.F. 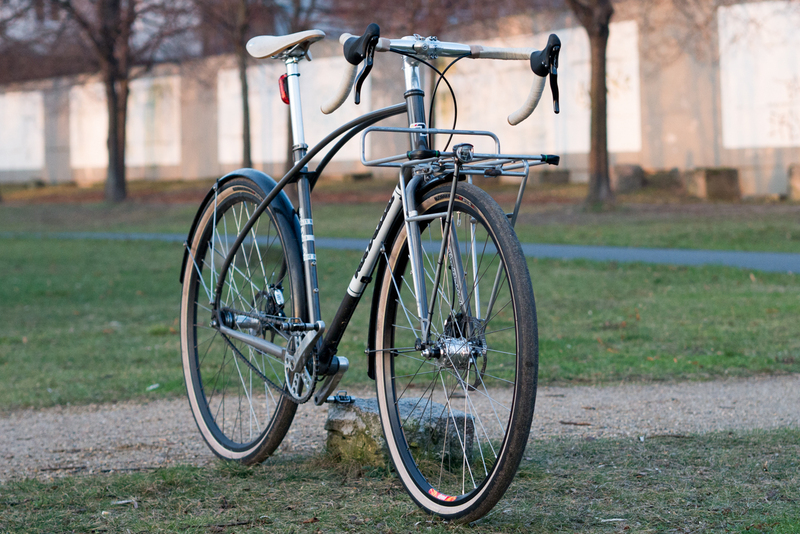 There were other options from the usual suspects, but I’ve been dreaming about a curved top-tube bike for a long long while and finding something that meets all the requirements as well as looking awesome was a great eureka moment. Not only did the W.T.F meet all the specifications above, it also has a distributer in Europe (well…in the U.K which is close enough). I contact Bearded Man and spoke to David who was more than happy to let me check out two frame sizes and was also quick to respond and sounded very nice. 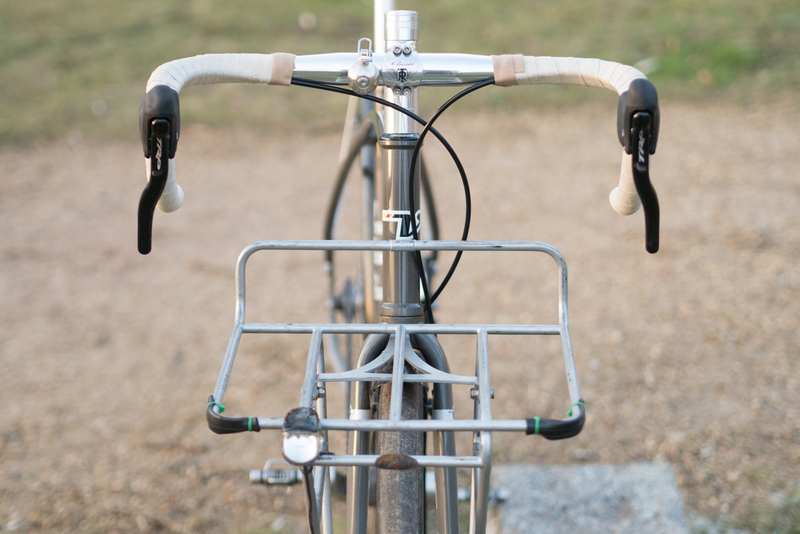 On my previous commuter, a 61×61 steel frame, I always felt stretched. 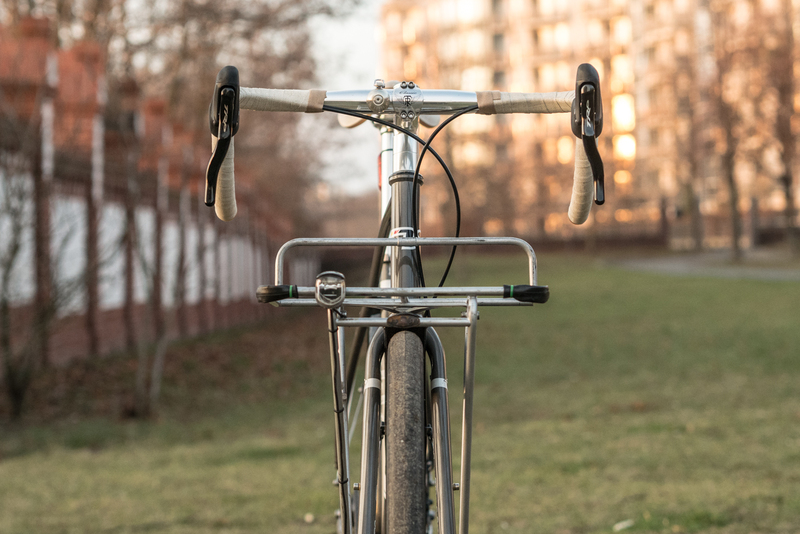 All my other bikes are much smaller with geometries that are more appropriate for someone with a back that does not like to bend too much and a long torso. So I decided to go for the 59CM model and add spacers to get more height. The frame is a perfect fit as it now configured. The frame arrived and the search for the components started. 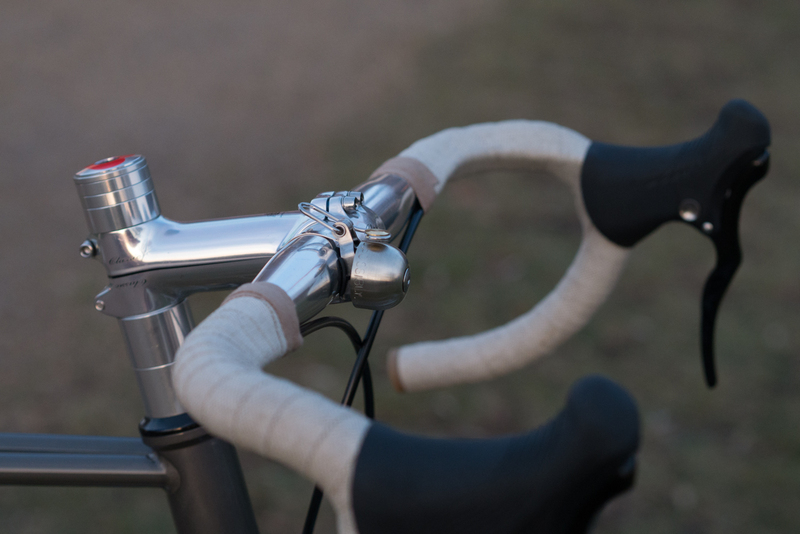 I wanted to use my White Industries ENO crank set which meant that a I needed a solution to build a standard into BSA in a frame and PF30 bottom bracket. 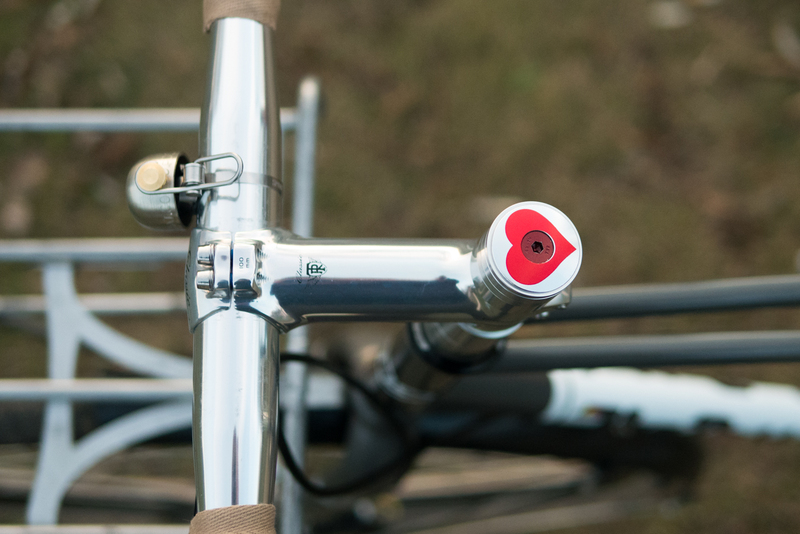 I could not find an eccentric bottom bracket that will also also convert PF30 to BSA. Instead I found a PF30 to BSA shell from FSA. 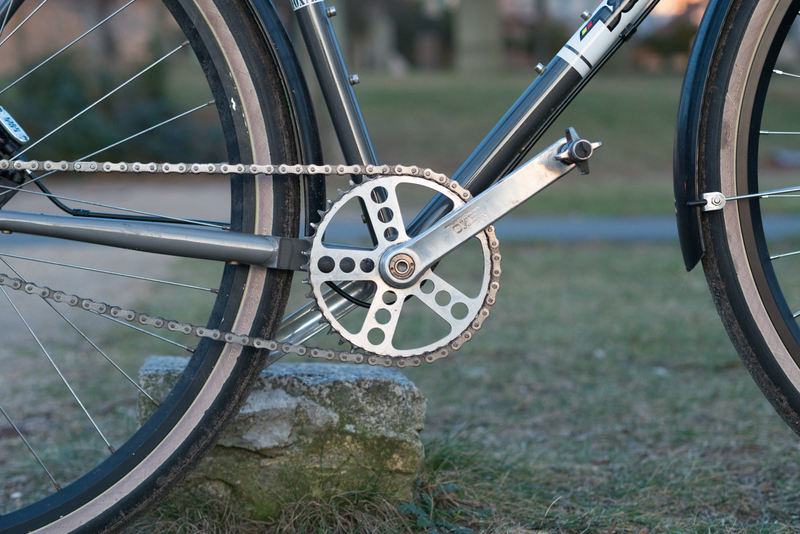 This meant that the cranks could be used, but chain tension remains a question. 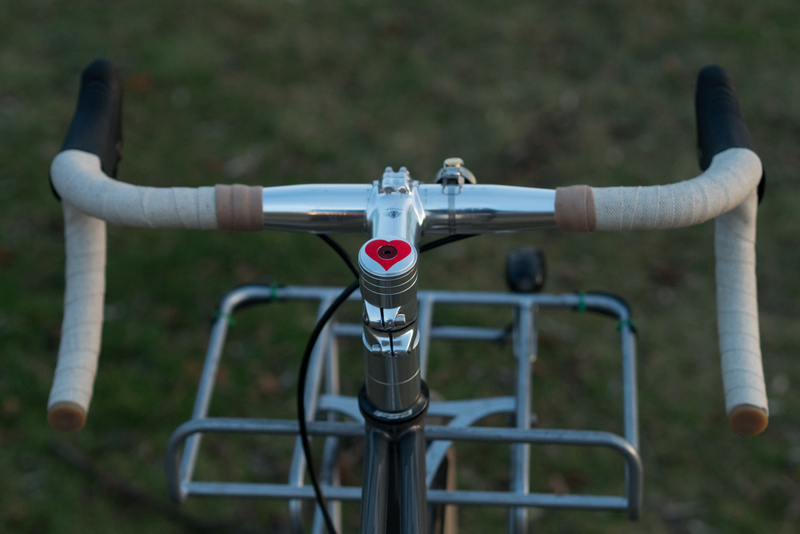 In came the second White Industries component – the ENO Eccentric hub which magically appeared on one of the forums I read just as I was about to give up the search. Now only did the second wheel appear in perfect timing, it was also being sold by a person I know – the stars were aligned. And after all this bike geekery, how does she ride? She rides great. Riding Vinni (yes, we named her) is like riding a snake that’s sliding on butter on a hot pan. She is nimble even with a whole week’s shopping worth in the front. She is fun and is likely to also spend time outside of the city when summer arrive. 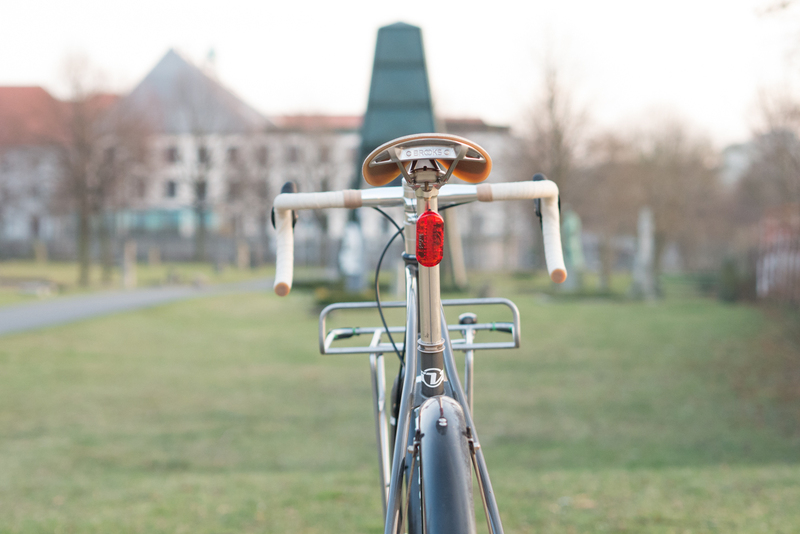 For the first time since I started riding in Berlin, some 10 years now or so, I actually had a taxi driver pull me over and ask where I got the bike and if I can build one for him. In the eternal war between cab drivers and cyclists, i can say that Vinni may also bring peace. 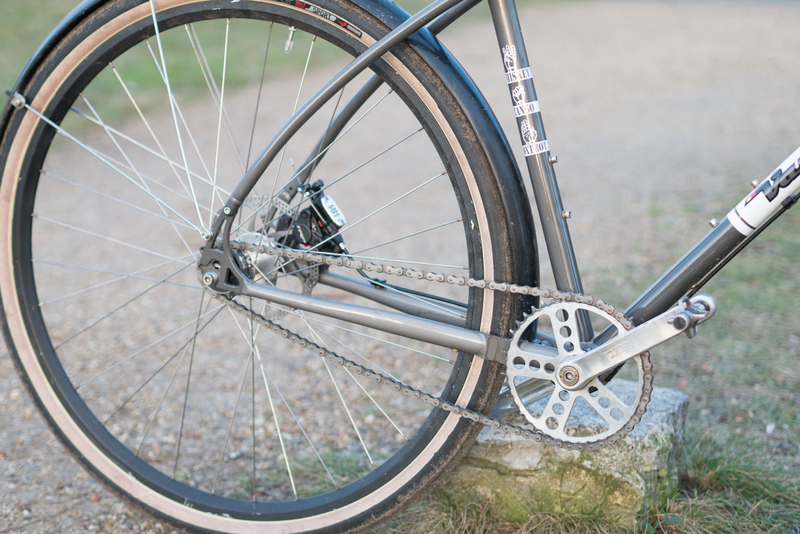 Any problems with the rear fender rattling, etc, due to the lack of a seatstay bridge? That’s a great looking bike. 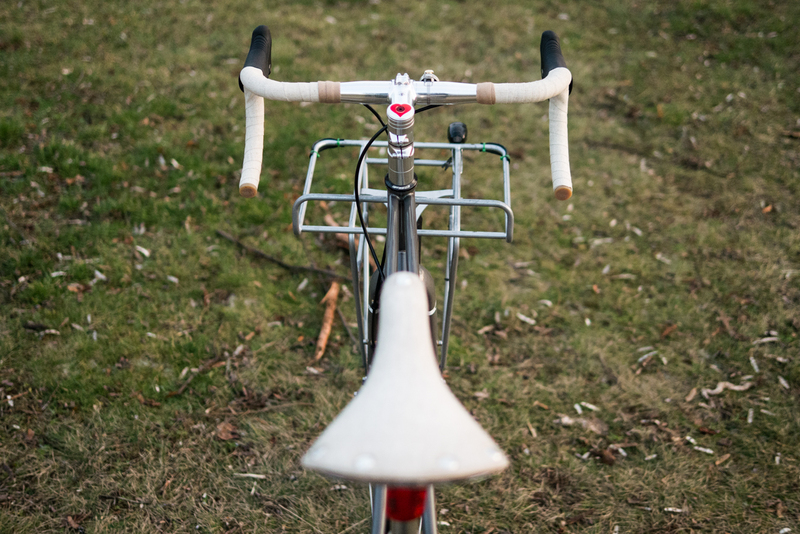 Just curious, though, do you have any problems with the rear fender due to the frame’s lack of a seatstay bridge? Mark, I had no such issues. 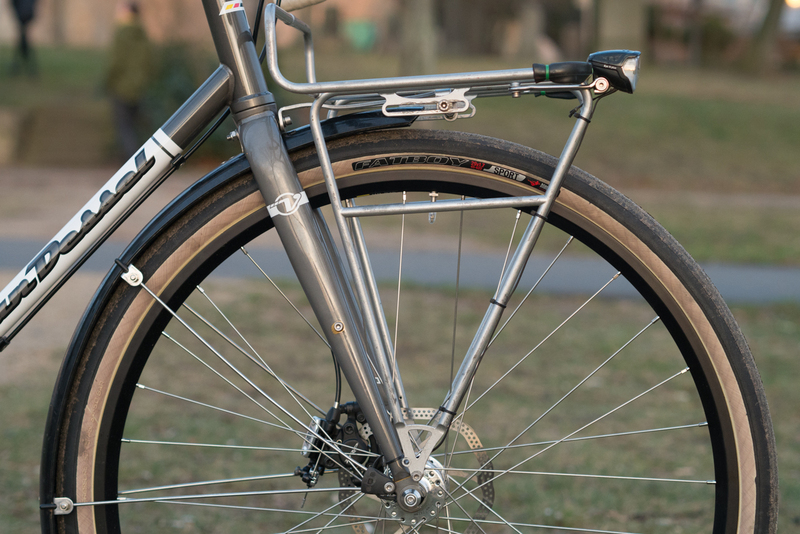 The frame has all the tabs needed for fenders. This post is old, but just in case you still check in from time to time. I have a grey WTF and thinking about a new CX build wheel set. I like how you have somewhat of a white wall tire on your commuter. What do you think about a white (velocity aileron) rim with purple (hope pro) hubs? I’m asking from a purely aesthetic viewpoint and curious if you had an opinion what that comebo would look.